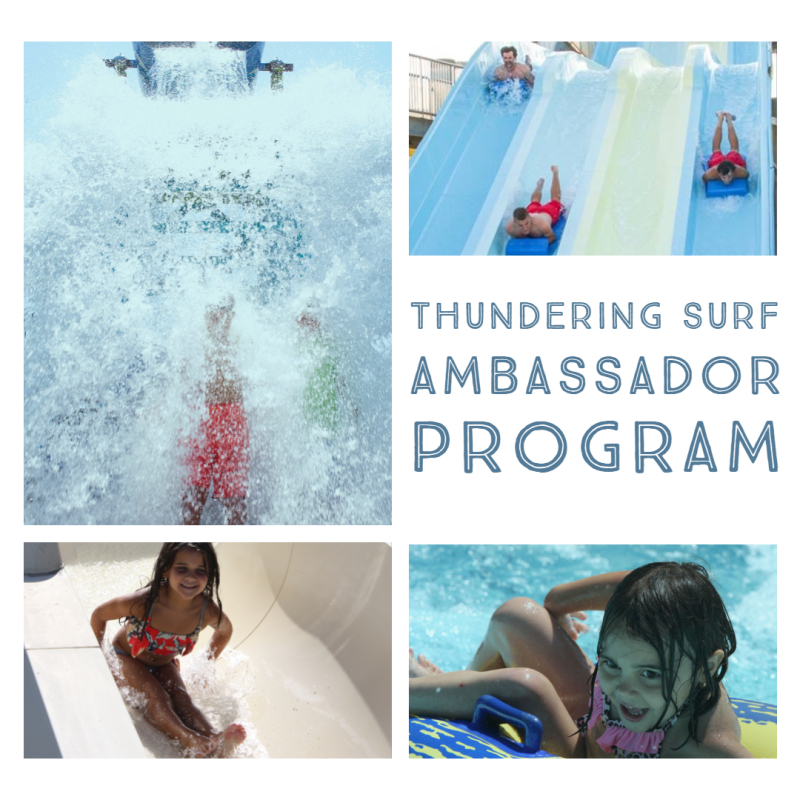 What is the Thundering Surf Ambassador Program? Thundering Surf Water Park has been operating since 1977 and for over 40 years we have helped create family memories. This program has been developed to showcase those memories on our webpage, social media accounts, and advertisements. In return the selected families and members will be compensated for generating photo and video content that can be used to showcase the family fun we offer at Thundering Surf Water Park. What are the expectations of Ambassadors? Families and members will be expected to generate the following content at least one time per week during the season. Candid photos or videos displaying their and friends enjoying our park; whether it be riding the water slides, floating around the river, playing a round of adventure golf, racing each other down Rainbow Rapids, exploring Cowabunga Beach, conquering the Flow Rider, or showing off your favorite Thundering Surf apparel around town or at an event. *Content must be of the selected members and families. We cannot and will not use any content provided that is of another family without prior permission from that family to use the photo or video. As well as sharing the content with us, members will be expected to post to social media (Facebook and Instagram) at least twice a week as well. The photos and videos can be the same ones submitted to the park that week. The posts should include the dedicated hashtags that will be provided to members once selected. In addition to the compensation above, there will be a monthly contest between members. Based on content quality and consistency from the previous month, one family will be selected for June, July, and August for a free 3 hour cabana. Management will offer available dates and times for members to choose from. Since these members do not visit the park as often as season pass holders, the frequency that they are expected to post or provided content is once per visit rather than per week. How do people enter to become an ambassador? If you are interested in joining this program then you can enter using one of the following methods. Share an image or video from the waterpark. What is your or a family member’s favorite memory at the park? Have you posted about the park in the past, and if so can you share with us? Please provide your Facebook and Instagram handles that you follow us with. When will we pick our ambassadors? All emails and posts received or posted up until April 1st will qualify and be reviewed. Those entries that are selected will be notified by May 4th.